The 2011 World Cup match between India and England played at Banglore was made exciting by an absolutely poor bowling performance by the Indian bowlers. Barring, Zaheer Khan’s lucky spell in the later part of the game, England won the game convincingly. Even the last partnership proved that ours is a toothless attack hitting them for sixes at will. Indian Captain Mahindra Singh Dhoni has been riding on his luck for quite some time and looks like this is the borderline match that will drift his lucky ride down to a different level. What made me more disgusting was the onfield conduct of the Piyush Chawla after getting hit and taking the wicket of Bresnan in the penultimate over. He was using an swearing publicly at the player and using the most unwarranted language (Ba*** Ch**th) to be exhibited to millions of public especially youngsters watching the game at the stadium and live on TV worldwide. It added more insult and opportunity of public display as all the TV channels showing expert commentary showed the particular over which was one of the turning point for the match. As an ardent cricket lover and of Indian Cricket Team, I feel extremely ashamed by his conduct and display which is devaluing our culture and hospitality. In addition, conduct of such types seen by youths may be an unwanted example to emulate. Piyush Chawla by his conduct therefore have done an offense (No. 2.1.4) according to the ICC Code of Conduct and I humbly request ICC and BCCI to act strongly against him by imposing suitable fine and/or even banning from one match. All Indian players, in particular bowlers should also be warned against using abusive language in Hindi or any other language when on field. I wonder where are the Shiv Sena, Rama Sena and the women rights wing members, when players freely exhibit such unwarranted public display against of emotions about our motherhood and culture. Wake up and act against them. Not to forget one of the recent YouTube videos of a match played (not world cup) where the stump mike picked Mahendra Singh Dhoni commenting on Sreesanth fielding at the boundary line not to watch girls and request MSD to control what is happening just under his nose being done by some of his favorites. In that way, looking at Sreesanth’s aggresion and the punishment he has received were mostly biased when considering these type of abusive expressions happening on the field. Cricket is a game involving huge money and television audience. Thus, code of conduct by players have great value. This entry was posted in Sports Reviews. The book fair is aimed at promoting the value of books as well as highlighting the importance of facilitating, acquiring and developing a culture of reading and the importance of reading to the local society. A meeting was held recently at the Supreme Family Council headquarters, which was attended by representatives of stakeholders, who discussed various aspects of the fair. 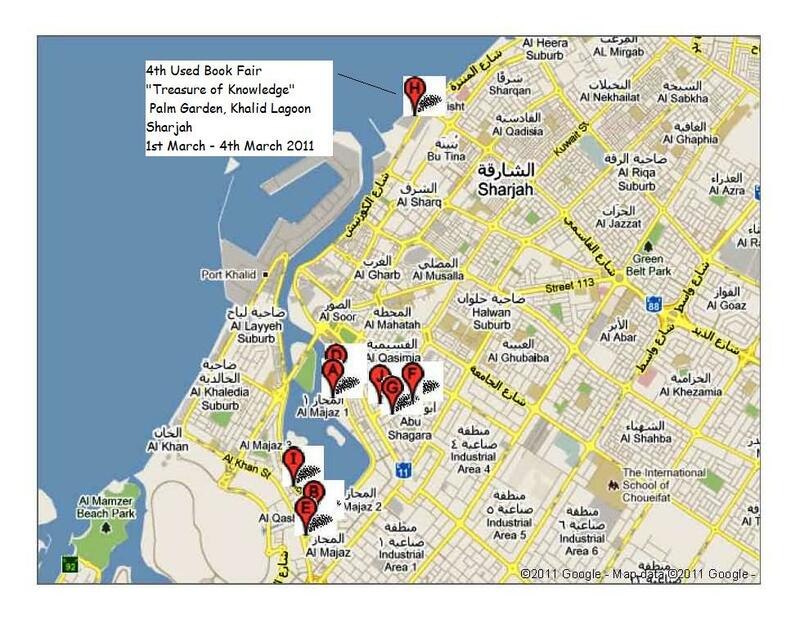 The event will be held between March 1 to 4 at the Palm Garden in Sharjah’s Khalid Lagoon. A number of schools, universities and individuals will take part to support the SCHS. Abdul Karim, one of the co-ordinators said that the condition for the collection of books for the fair will be wide enough to cover all aspects of literature and those who participate and offer over 20 books as donation for the fair will receive a certificate from the SCHS. The prices of books will range from Dhs5 to Dhs20. He said that the SCHS, which is main organisor of the event, will provide facilities to those who wish to install their stall, including tents, tables, chairs and banners bearing the name of each participating organisation. The last date for setting up a stall is Feb.28. Mona Abdel Karim and Mohammad Fawzi have asked private schools and universities to take place in the humanitarian event, which aims at providing funds for the promote education and integration of people with disabilities. Ahmed Shaheen Al Hosani, who is one of the co-ordinators, discussed the preparations for the book fair. However, Fawzi presented a comprehensive definition of the fair to target both public and private schools, universities and non-profit organisations. The officials said that SCHS wants to promote the importance of volunteerism by all members of society. Mona Abdel Karim said that students with intellectual disabilities would be participating as volunteers. To read it in original, please visit, GULF TODAY online. This entry was posted in Community Service, Manzil, Sharjah City for Humanitarian Services. A prototype of the first Mercedes Benz vehicle displayed at the Emirates Motor Company (Mercedes Dealers) Showroom and Service Centre at Mussaffah Abu Dhabi. This entry was posted in Clicks and writes, Exploring Abu Dhabi, Photo Speaks. This entry was posted in Exploring Abu Dhabi, Photo Speaks. knowledge, experience and vision for the outgoing students of Class XII. As usual, one speaker was outstanding in his speech. It was none other than Padmashree Dr. B R Shetty, Chairmain of ADIS Abu Dhabi. With his inimitable wit, simple language and concentration to fit in key points in between, he captivated the students and parents with several interesting topics within a short time. I always admire his speeches as he speaks from his heart and brings out important points in simple ways through example from his own life and work. This has attracted me and whenever I get to listen to him, I video him talking. This routine followed this time too and I captured his speech in its full. The programme continued and during the final speech, I realized, I have photographed all the speakers except Mr. Shetty. What to do? It was at this time that the speaker, a student highlighted the importance of his school life, the role of support staff and his memories and life at school and after, which he looks forward to. It brought in all the listeners, how the children visualize the world differently from adults. Listening to the young student, Mr. Shetty, suddenly got up from the dais and went to the event coordinator and requested her to give an opportunity to speak once again for a short time before the course completion certificates are distributed to the outgoing students. Addressing the children for the second time he said, Dear Students, wherever you go and whatever you do afterwards, you should try and capitalize the experience and advantage of their study at ADIS Abu Dhabi, which is one of the best schools in the region and their stay in Abu Dhabi, which again, one of the best planned city in the region. They should be ambassadors of both the school and the city wherever they are. He requested them to visit the city their alma mater, whenever they get an opportunity to, and come back to the school, observe the new development and progress happening and requested to them to contribute to the welfare of the generation who are in it at that time. He advised them to take it as their own personal responsibility and commitment to the school. Instant thought, reaction and action it was, but very valuable, not only for the children but all those who were present there. It proved to be a blessing in disguise for me as I could then capture him while speaking and it completed my entire sequence of the evening, which was a very special day for me. It was my sons last day in school. It is very rarely these days one get to listen to such motivating speeches and speakers who, without inhibition, takes the pain to request for an opportunity to speak again and that too from their heart to express an afterthought of importance. Thank you Shetty Sir, you made the evening more blessed for all. And we all enjoyed. It was a fun filled day. Courtesy to AMERICANA, Chuck E Cheese, Barakat Fresh & Easy, there were so many activities, refreshments that kept the whole morning lively and memorable. This entry was posted in Community Service, Manzil.